When specifying and planning medium voltage switchgear for a substation, functions and influencing factors must be matched and an economically efficient solution must be found among the offerings of manufacturers. The same influencing factors and requirements can be weighted differently by different manufacturers. 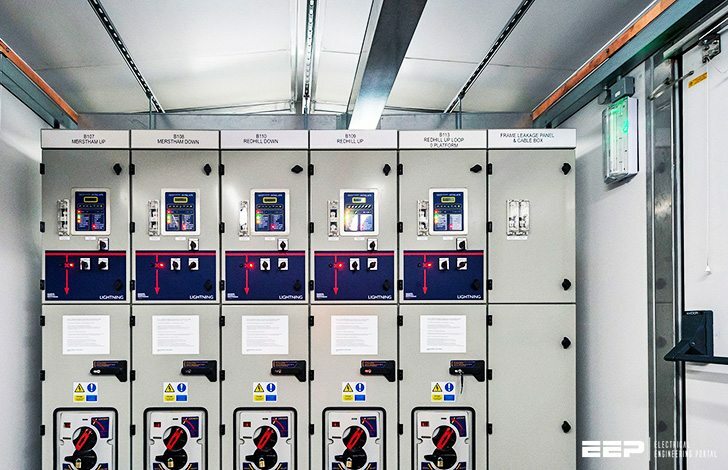 Generally, a switchgear substation MUST provide a high level of safety so that both operator protection and fault-free network operation is ensured. It must meet the requirement of touch protection and exclude the possibility of maloperation. If a fault occurs nevertheless, its impact on the fault location should be limited and not entail personal injury. Primary Distribution – What is characteristic for the primary distribution level are high load and short-circuit currents and high-end secondary features of the switchgear with regard to protection, measuring, and (remote) control. At the primary distribution level (Figure 1) you will find the main substation, where energy is fed in with a higher voltage and transformed to the medium-voltage level. The switchgear is almost completely equipped with circuit-breakers. They switch large consumers, mostly in industrial plants, or cable rings which feed switchgear at the secondary distribution level. The currents are lower, short-circuit protection is often ensured by the assigned circuit breaker at the primary distribution level. The requirements placed on secondary features are usually lower. The consumer substation from which the energy is distributed at the fed-in line voltage (medium voltage). A load transfer switch (coupling) in the substation can form the property border between the supply company and the customer if the customer wants to develop his switchgear part independently. In that case, measuring and metering equipment for billing will also be available. The substation, also called secondary unit substation, where the energy is transformed from medium into low voltage and distributed as such. 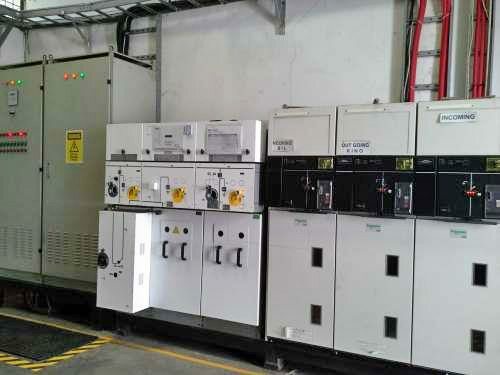 In industrial plants, substations are often installed in the production centres which are also load centres. Therefore, these substations are called load-centre substations. 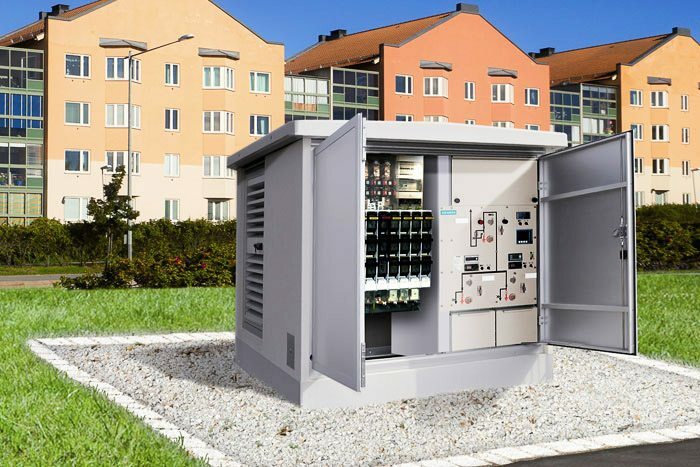 For very compact-built substations which are not accessible, the designation ‘small’ or ‘compact substation’ has become popular. On-site or workshop-built switchgear in accordance with IEC 61936-1 (VDE 0101-1), as it is rarely built nowadays. In the following, we will describe the metal-enclosed, type-tested medium-voltage switchgear in accordance with IEC 62271-200 (VDE 0671-200), since both mouldedplastic enclosed and on-site built, i.e. workshop-built plants are manufactured significantly less frequently. The high manufacturing and testing expense often amortise only if high quantities are produced and the production is standardised accordingly. The technical data must be verified by type tests. The manufacturing quality is monitored by routine tests. For example connection to earth, grid voltage, grid frequency, neutral-point connection, ambient conditions, peak short-circuit current. For example insulation level, neutral-point connection, overvoltage protection, short-circuit duration, type of operating area, plant design. Table 1 gives an overview of the configuration parameters and characteristics which may play a part in the planning. The most important aspects are presented in more detail below. A maintenance-free pressure absorption system, laid out as “special cooling system” reduces pressure-related and thermal impacts of an arc fault so that personnel and building will be safe (Figure 4). The medium voltage switchgear is usable as indoor installation in accordance with standard IEC 61936-1 (VDE 0101-1). Switchgear types in locations with no access from the public, outside closed off electrical operating areas. Switchgear enclosures can only be removed with the aid of tools and operation by ordinary persons must be prevented. Closed electrical operating areas: A closed electrical operating area is a room or location used solely for the operation of electrical switchgear and is kept locked. Access is only granted to electrically skilled persons and electrically instructed persons. Ordinary persons are allowed only when accompanied by electrically skilled or instructed persons. These are corridors, connecting passages, access areas, transportation and escape routes. Corridors and access ways must be sufficiently dimensioned for work, operation and transportation of components and must have a minimum width of 800 mm. Corridor width must not be obstructed by equipment protruding into the corridor, such as permanently installed drives or switchgear trucks in disconnected position. 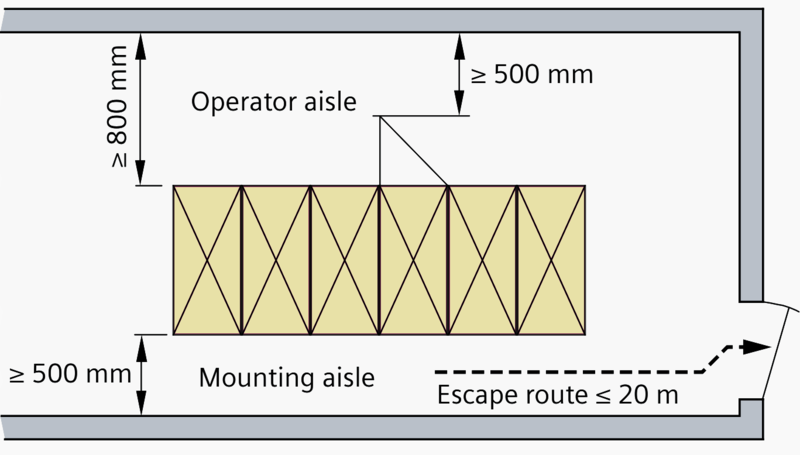 The width of the escape route must be at least 500 mm, even if removable parts or fully open doors protrude into the escape route. Switchgear panel or cubicle doors should close in the direction of escape. For mounting and maintenance work behind enclosed units (stand-alone) a passage width of 500 mm is sufficient. A minimum height of 2,000 mm below ceilings, covers or enclosures, except for cable basements is required. Exits must be arranged in such a way that the length of the escape route inside the room does not exceed 20 m in case of rated voltages up to 52 kV. This requirement does not apply to walk-in busbar or cable conduits or ducts. For installations with a rated voltage up to 52 kV, the length of the escape route inside the room must not exceed 20 m (40 m for installations above 52 kV). Fixed ladders or similar facilities are permissible as emergency exits in escape routes. The IEC 62271-200 (VDE 0671-200) standard for metal-enclosed switchgear distinguishes between accessibility level A for authorized personnel and accessibility level B for unlimited access (also for the general public). In addition to this, the opening possibilities of a compartment are distinguished, which influences the accessibility, and thus the availability, of a switchgear. It must not be opened. Opening such a compartment could destroy it and impair functioning of the switchgear. An interlock in the the panel grants access when live parts are isolated and earthed. Opening the switchgear under normal operating conditions or for maintenance, for example to replace HV HRC fuses, is possible. Access is described through instructions of the operating company, and a lock shall ensure safety of access during normal operation and maintenance. IEC 62271-200 (VDE 0671-200) specifies categories of operational availability (LSC, loss of service continuity) of the functional units of a switchgear. They describe which parts must be put out of operation during the opening process of an accessible switchgear compartment. A single busbar is sufficient for most supply tasks, even if this supply task consists of two incoming feeders. It is straightforward and easy to handle, which reduces the likelihood of switching faults. When fault-affected switching operations happen, circuit-breakers only must be operated. If the wrong breaker should be operated inadvertently, this would not have any safety-relevant consequences in the switchgear, since circuit-breakers are capable of making and breaking all load and short-circuit currents, even under earth-fault and other fault conditions. In case of more intense branching (rule of thumb: more than five feeders), the single busbar can be subdivided once or several times, with its own feed-in in every section. Disconnectors or switch disconnectors at the interruption points create bus sectionalizers, whereas circuit-breakers create longitudinal busbar couplers (BCL). A BCL makes sense if the busbar sections are to be operated as alternately separated or coupled. Two or more feed-in points must always be operated separately (for example because there are different suppliers, or embedded power generation is used separate from the public grid). Consumers with disturbing perturbations on the grid are separated from consumers placing high requirements on the power supply quality. Consumers classified according to importance and assigned to service continuity requirements placed on the grids. Apart from the first example, examples two to four allow the use of a transversal busbar coupler (BCT), which permits changing busbars without interrupting the energy flow (Figure 7). A successful type test of medium voltage switchgear also requires an internal arcing fault classification IAC in accordance with IEC 62271-200 (VDE 0671-200). The specification means that the rear side may only be accessed by qualified personnel, whereas the front and lateral sides may be accessed by anybody. The internal arcing test was made with a test current of 25 kA for a duration of 1 s.
Note: Medium-voltage switchgear are generally tested for accessibility of Type A. Only complete, factory-assembled stations (transformer /load-centre substations) are tested for Type B. Testing normal switchgear for conformance with Type B doesn’t make sense, since they will always be built into an additional station housing in public spaces. Keep operating aisles as short, high and wide as possible. Use sealed encapsulations or covers instead of encapsulations with openings or meshed wire. Deploy installations which are arcing-fault-tested instead of installations in open design (e.g. installations in accordance with IEC 62271-200; VDE 0671-200). Bleed off arc gases into a direction away from the operator personnel, and if required, out of the building. Ensure very short tripping times from fast-acting relays or devices that respond to pressure, light or heat. Operate the installation from a safe distance. Prevent the re-energization by use of non-resettable devices which detect internal equipment faults, incorporate pressure relief and provide an external indication. A calculation of the dynamic pressure load on the operating room, from which an architect or structural engineer may recognize the stress on building structures, is recommended. The operating room must be equipped with pressure relief openings of sufficient cross section or with a pressure relief duct. 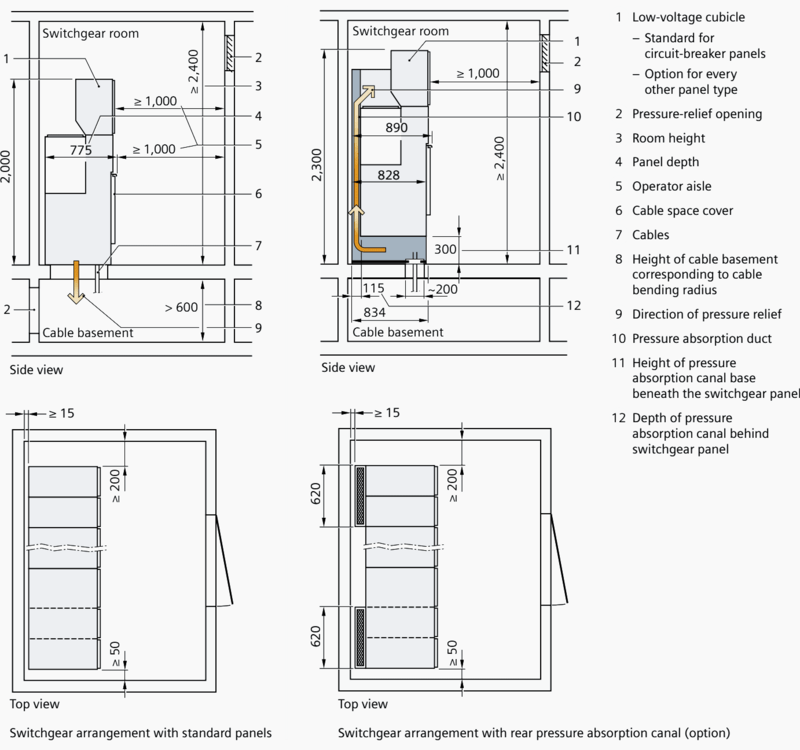 Siemens provides two calculation methods as a service to establish rough guidance values for the calculation of the room size and /or pressure relief openings during the planning phase. A simple method provides the estimation according to F. Pigler for rooms up to 50 m³. Data on the room volume, the area of the free relief cross section and the short-circuit current to be tested are entered into a matrix. This supplies a simple curve progression for the overload pressure (see Figure 8). Although the incidence of an internal fault (arc fault) is very unlikely in type-tested air- or gas-insulated switchgear, the consequences of such an arcing fault may be severe for the operating personnel as much as for the room itself. For this reason, appropriate measures in relation to the room situation must be provided for pressure relief, such as pressure relief outlets, ducts, absorbers or coolers. Possibly this must already be considered during the installation and room planning stage. 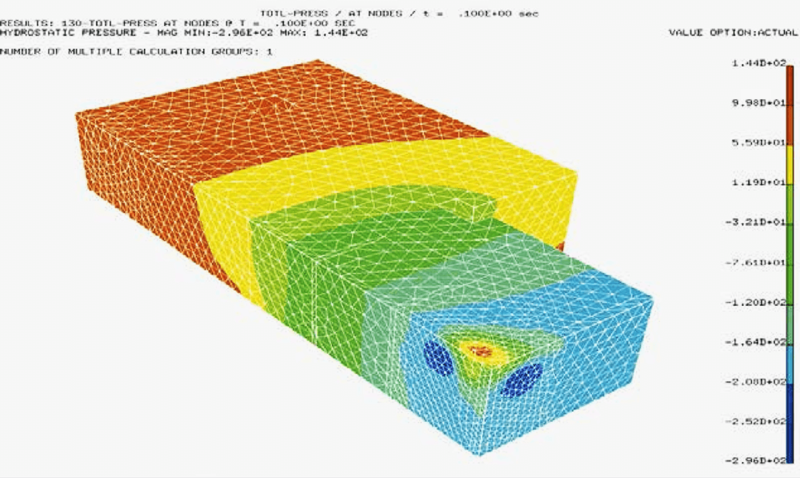 With the aid of ultra-modern finite element methods, pressure calculations can be performed in the entire three-dimensionally mapped space over the entire burning time of the accidental arc. 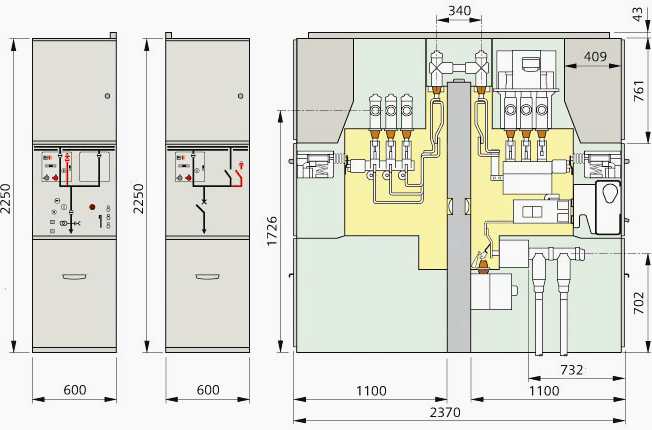 Some manufacturers of MV switchgears, such as Siemens – offers the service of a numerical calculation on the basis of a 3D volume model, where the real installation of the switchgear, pressure development, reflection, and arrangement of the pressure relief openings is taken account of. Various pressure load scenarios can be calculated for specific switchgear types, short-circuit currents, and installation sites. Thus the customer benefits from extended planning security and a cost-optimised solution. The flow conditions are defined as boundary conditions. Firstly, these are the switchgear steel sheets and secondly, the absorber sheets to be penetrated. At last, the pressure relief openings in the switchgear room are defined. But the model also allows to calculate a fully enclosed room, or factor in pressure relief openings with a pre-defined response pressure. As a result, the model yields the pressure rise and the flow conditions at any point of the finite elements grid over time. Additionally, the pressure distribution on the walls can be shown as a contour plotting at a certain point in time (Figure 9). Note: Typically, the overpressure caused by an arcing fault, when assuming the same room volume, is significantly higher for air-insulated switchgear than for metal-enclosed, gas-insulated switchgear. Im interested with both single and three installation. kindly forward single information as well.